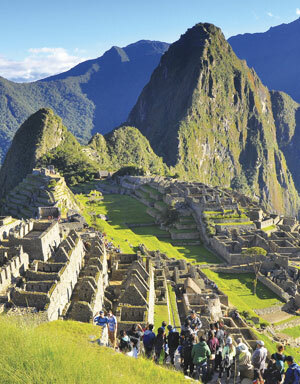 Machu Picchu in Peru attracts hundreds of thousands of visitors each year. Archaeological sites are popular tourist destinations. But large numbers of visitors often present unique management and conservation challenges. High volumes of tourists can create congestion, which can harm the visitor experience. Archaeological sites are also vulnerable to erosion and damage caused by large numbers of people. In 2015, the Peruvian Ministry of Culture wanted to conduct a study to see how many visitors could safely visit Machu Picchu at one time without damaging the sanctuary or diminishing the tourist experience. Cultural Site Research and Management (CSRM), the organization tasked with carrying out the study, used a combination of infrared sensors, visitor observation, 3D modeling, network analysis, and mobile and web-based GIS to assess and improve movement around one of the most visited archaeological sites in the world. While some archaeological sites, such as the great city of Angkor in Cambodia, can accommodate many millions of visitors every year, others are far more sensitive. In extreme cases, like at the cave paintings found in southern France and northern Spain, sites have been closed to the public to protect the relics from damage. That is because each archaeological site has a unique carrying capacity—the number of visitors able to safely visit it at any one time without damaging the site or constricting visitor experience. The great Inca citadel of Machu Picchu is one of the most stunning and iconic archaeological sites on the planet. It was built in the mid-fifteenth century, never discovered by the invading Spanish, and abandoned at the beginning of the sixteenth century. It was rediscovered amid dense forest by American archaeologist Hiram Bingham III in 1911 and now attracts hundreds of thousands of visitors every year. In 1983, the stunningly beautiful and enigmatic place, shrouded equally in cloud and mystery, was inscribed as one of the first UNESCO World Heritage Sites. Machu Picchu is a complex site where visitors are free to stay as long as they wish and explore many kilometers of paths, roadways, and open spaces without a guide. Some tourists arrive at the site via bus from the local town, while others reach it on foot from one of the sanctuary's Inca Trails. Researchers used ArcGIS Network Analyst to record tourists' typical visit times along paths and in significant locations at Machu Picchu, making it possible to explore alternative routes. At 6:00 a.m., when the site opens, there is a huge rush of visitors—many of whom come to watch the sunrise. By lunchtime, however, 80 percent of tourists have left the site, and afternoon visitors are often treated to a nearly empty citadel. This suggests that balancing out visitor flow over the course of each day, so that people do not arrive in large waves, would lead to less crowding and a more uniform distribution of people throughout the site. As such, understanding how people get to and move around the site was central to establishing a carrying capacity. CSRM used three methods to record visitor flow: giving visitors different-colored stickers depending on when they arrived, tallying tourist numbers using infrared counters, and making qualitative assessments of visitor behavior. Each tourist who entered Machu Picchu during the study period was given a time-specific sticker according to what time he or she arrived. For example, people who entered between 6:00 a.m. and 8:00 a.m. got blue stickers, those who arrived between 8:00 a.m. and 10:00 a.m. received red stickers, and so on. These easily discernible stickers allowed researchers to visually track people around the site and see how long they stayed, as well as how often people revisited key points like temples or certain vistas. Researchers also placed infrared counters at strategic locations around the citadel. These recorded the number of people who broke the infrared beams every hour, providing data on which areas and paths were busiest at different times of day. 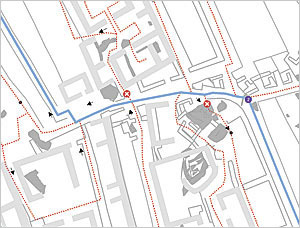 To evaluate the locations and density of visitors, researchers used ArcPy [a Python site package] to develop a geoprocessing tool that parses the sticker and counter data from comma-separated value (CSV) files, interpolates it using ArcGIS 3D Analyst, and then georeferences it to the architecture of the site. This produces a raster heat map, which uses a set color scheme and shows congestion at Machu Picchu at different times based on actual numbers of visitors. This process can be scheduled to produce a day's worth of heat maps in just a few minutes. 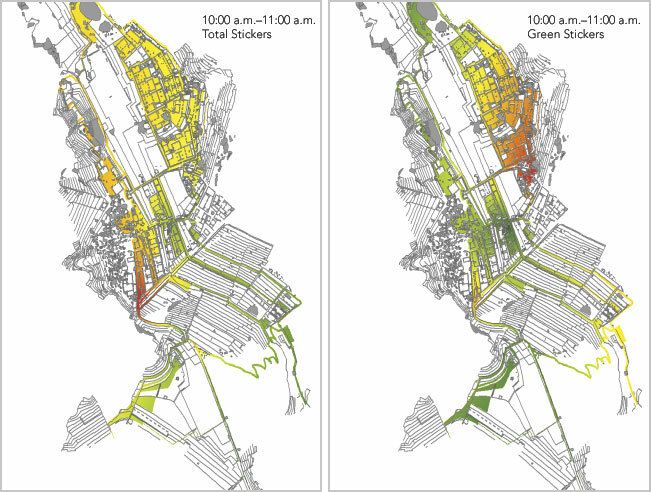 The tool made it possible to visually compare how timed entrants move around the site (based on the color of their stickers) and how these correspond to overall congestion (using the infrared sensors). The research team produced a raster heat map that shows congestion around Machu Picchu at different times based on actual numbers of visitors. While these approaches were valuable, they did not directly reveal information about congestion, which is a much more experiential phenomenon. Thus, the team employed a third technique: using Collector for ArcGIS to record real-time congestion data. Researchers also used ArcGIS Network Analyst to generate a geometric network for Machu Picchu. 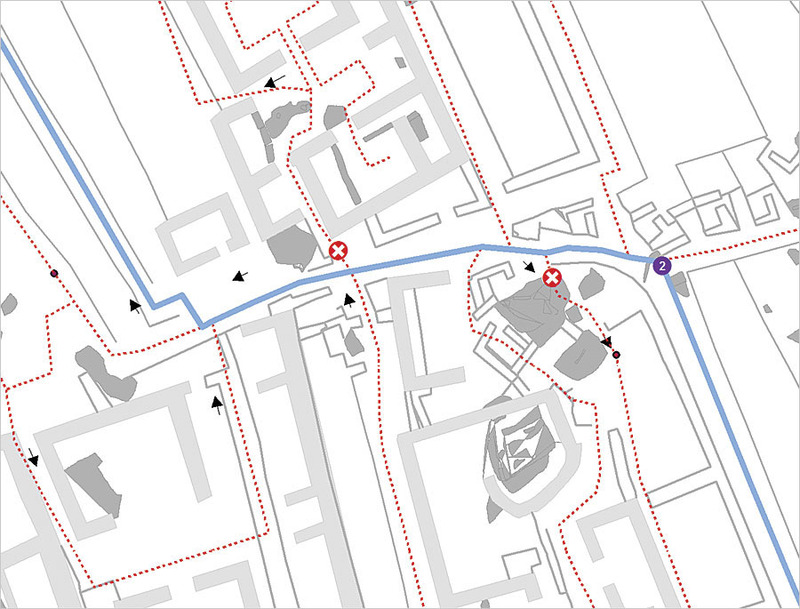 Although typically used for traffic modeling, the ArcGIS Network Analyst extension was ideal for the citadel. Because the vast majority of visitors use a guide when they go to Machu Picchu—and tours tend to stop at open spaces and in key buildings or locations around the site—experienced tour guides have a good idea of how long people spend in specific areas. So the research team consulted these guides to find out typical visit times along paths and in significant locations. Putting these into the geometric network—applied as costs—made it possible to explore alternate routes, what could happen by changing the directionality of some paths, and what the effects would be if parts of the citadel were closed at certain times. Pairing observational methods with mobile and desktop GIS enabled CSRM to better understand how tourists tend to visit Machu Picchu and what the site could do to curb congestion. While CSRM set out to determine the specific carrying capacity for Machu Picchu, GIS helped researchers discover that it varies depending on a slew of different factors, such as the weather, visitor demographics, and the time of year. Thus, Machu Picchu's carrying capacity needs to be continually monitored. To alleviate overcrowding, CSRM suggested that the archaeological site implement a permanent geospatial monitoring system (based on the tools used during the study) that can record visitor movement and congestion over time. The organization advised periodically assessing the data to change routes when necessary and even offering alternative visitor experiences—away from congestion areas—that would change the way people move around the site. CSRM's project at Machu Picchu proved that GIS can be used to continually mitigate crowding and damage at popular archaeological sites—especially those that are prone to varying visitor numbers and whose site infrastructure is in danger of being altered by sightseers. As more people take to traveling around the world to experience its wonders, important archaeological sites are at ever-increasing risk of irreparable damage. Researchers at CSRM hope to soon test the GIS-enabled techniques they employed at Machu Picchu on other sites to ensure not only their preservation but also their continued accessibility. For more information, email Douglas C. Comer. Douglas C. Comer is president of Cultural Site Research and Management (CSRM) and the CSRM Foundation, as well as president of the International Council on Monuments and Sites (ICOMOS)/International Committee on Archaeological Heritage Management (ICAHM). William Megarry, a GIS specialist and archaeologist, is currently an ELEVATE Government of Ireland postdoctoral scholar at CSRM and Johns Hopkins University, where he is developing tools to detect and manage cultural heritage using aerial and satellite remote imagery. Bryce Davenport is a GIS specialist and archaeologist with CSRM, where he has worked on research projects funded by the NASA Research Opportunities in Solid Earth Science (ROSES) program; the US Department of Defense Legacy Resource Management Program; and governments in Peru, Moldova, Sudan, the Dominican Republic, and the United States.